Lawrence died in 2000. He was only 23 when he completed the works in 1941. The paintings depict various scenes of the multi-decade mass movement that began in 1915. They portray scenes of life and death, work, home and hardships for the millions of African Americans who relocated North. They were in pursuit of a better future. The paintings are in bold colors. It also was 1941 when they first were exhibited at the Downtown Gallery in Manhattan. It marked the first time a black artist was represented by a New York gallery. Soon after, they entered the collections of MoMA and The Phillips Collection in Washington. Each acquired half. 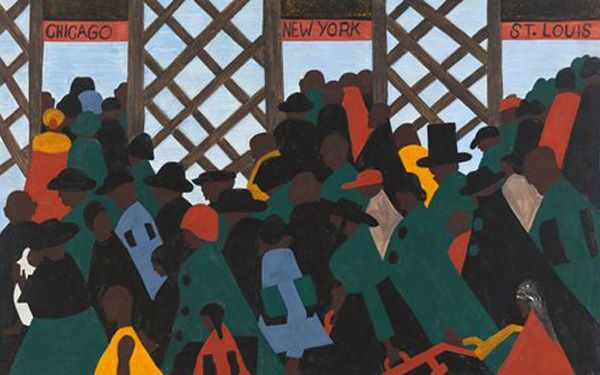 The exhibition is titled, "One-Way Ticket: Jacob Lawrence's Migration Series and Other Visions of the Great Movement North." It is the first time the entire series is on view at MoMA in 20 years. Phillips showed all 60 panels in 2008. To put the paintings in historical context, the exhibition also includes video and audio recordings of performances by Duke Ellington and Billie Holiday. There are photographs by Dorothea Lange and Gordon Parks. Also on display are writings by Langston Hughes and Richard Wright. A special interactive website allows people to explore zoomable high-resolution images of all 60 panels. In conjunction with the exhibition, the museum has commissioned 10 noted poets to create poetry based on Lawrence's series. The series opens with an image of a chaotic crowd in a train station. The crowd is pushing toward three ticket windows marked Chicago, New York and St. Louis. Lawrence was the son of migrants. The family moved to Harlem when he was 13. "He often spoke of hearing stories of people 'coming up' from friends and family," said Dickerman. Lawrence spent months researching the Great Migration before embarking on the series. He began by coming up with short captions for the scenes he planned. In an image of a large group of migrants weighed down with heavy bags, he simply states: "The migration gained momentum." Another of a migrant worker with his tenant landlord says, "tenant farmers received harsh treatment at the hands of planters." Among other reasons blacks left in droves were lynchings in the South. There was freedom to vote in the North, as well, Lawrence said in captions accompanying other pictures. I think that this painting represents that it was the enormous migration for African people to move to the U.S. because the United States has a lot of food also water also it is also common to flying animals because they migrate for other places to live in until winter is over. Well if Jacob had drew this painting, I think that it will make the Africans to move back or not. I think it's nice that people shared his work with others. I think he inspired other people who want to do art. And hope people can see it. I think that this exhibit can inspire many people. It may be very educational and worth to go see. It seems to be very cool. This is actually a great step in today society. Even though you learn about this in school mostly Social Studies classes but to actually have it displayed in front of you in an area with a lot of people mostly African Americans this is something worth seeing. When you learn it and school and to see it in person it will actually make you want to remember it. This exhibit may even change people's thoughts on things. 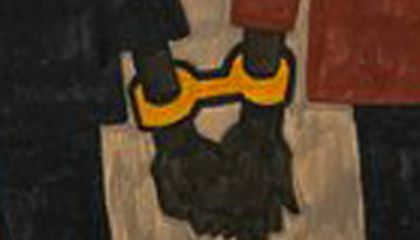 A tribute to the African-American migration, which today becomes mass was performed; and a way to honor this fact through this art exhibition entitled "One - Way Ticket ..." by Jacob Lawrence. Scenes of life and death, work, family, and the difficulties they had to spend millions of African Americans, to get a better life in the future. There are some scenes that are portrayed in art paintings. In my opinion, this is revealing of global way, as it marks a fact of racial way in the USA, and debate about discrimination and tolerance of people opens. Through this exhibition, I think it teaches how a group of people looking for better opportunities and to learn different cultures that have certain people. Answering the question of the challenge: I think it gets as title because ago concerning how the unique opportunity to grow as a family and as a person, because if we know, USA is a country full of opportunity and more of a human being It has been believed that in order to grow sustainably and culturally, this is the best place to live according to most humans who live in underdeveloped conditions.